This is love . 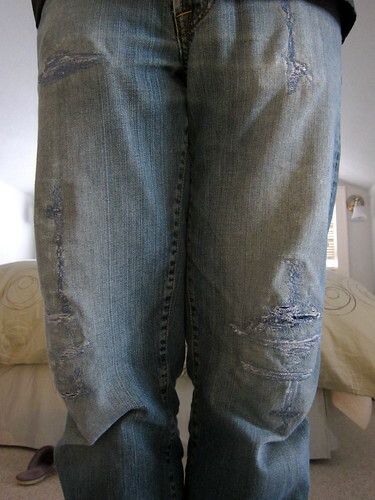 . .
My husband's love for his jeans . . .
Use a zig-zag stitch that has the stitch length shortened to just above a satin stitch and sew down and back over the tear (using the forward/reverse button on your machine). 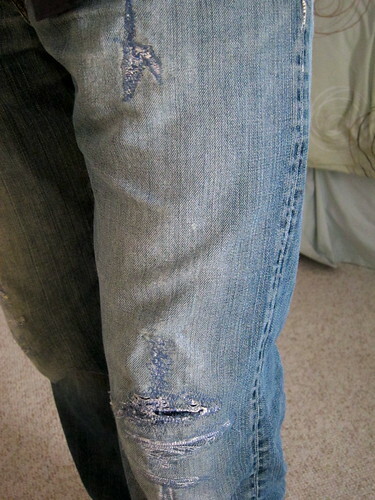 I use a piece of scrap denim on the inside of the pant leg as a "reverse patch". It adds some structural integrity back to a worn knee. Use the darning foot (with the feed dogs down) and a zig-zag stitch. This method is much faster, although it took me a little while to get consistent results (it's kind of like free-motion quilting). 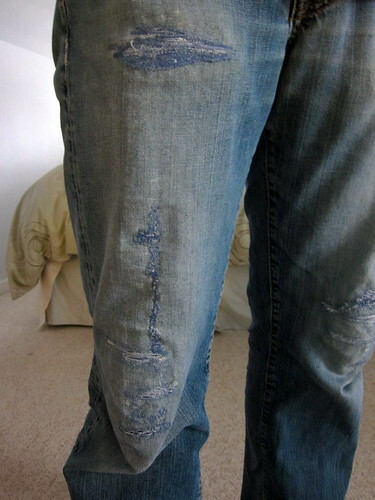 You also need a piece of scrap denim for this method. I would also recommend buying more thread than you think you'll need. For Will's jeans alone I've gone through 4 spools of thread!